This is not a good look for anyone — and it hasn’t been since, oh, the 1930s. That’s a selfie taken by German activist Lutz Bachmann, at the hairdresser’s, where he was temporarily rocking an Adolf Hitler haircut as well as the Führer’s trademark mustache. Unbelievably enough, Bachmann posted the photo, which he said was just a joke, to his Facebook page. When German and international news media picked up the snapshot far and wide yesterday, he promptly gave up his leadership role in Pegida, the anti-immigration group that has been organizing large rallies in Dresden and other cities for months. The leader of an anti-immigrant movement that has attracted tens of thousands of supporters and upended political debate in Germany stepped down on Wednesday after he was found to have posted an online image of himself as Adolf Hitler, after weeks of denying any Nazi sympathies. In the photograph, the leader, Lutz Bachmann, has his dark hair combed straight and severely parted above his right temple and wears a toothbrush mustache, closely resembling Hitler. 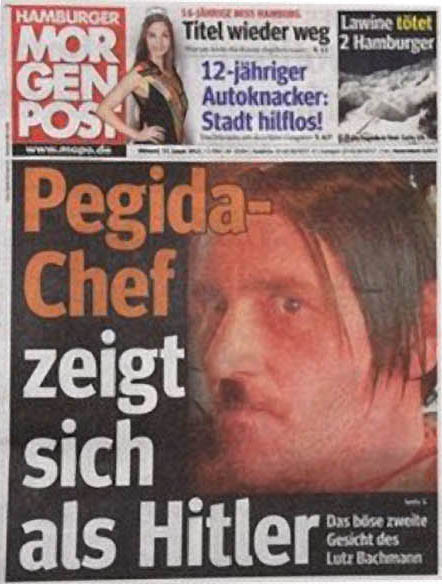 The image was found on Mr. Bachmann’s Facebook page and appeared on the front page of the mass-circulation newspaper Bild on Wednesday. It soon went viral on social media sites. Anyone involved in politics who dresses up as Hitler is either pretty much an idiot, or a Nazi. Bachmann sees it differently: he was just clowning around, trying on role that was meant to be a parody. Mr. Bachmann told Bild that he had posted the Hitler photo to coincide with the release of an audio version of a satirical book by Timur Vermes, a German writer, called Er Ist Wieder Da, or Look Who’s Back, in which Hitler returns to Berlin in 2011. “One has to be able to sometimes make fun of oneself,” he told the paper. Aside from having done incalculable damage to his own reputation and to the prospects of Pegida, Bachmann may also be facing legal trouble. Dresden prosecutors said they were investigating whether there were sufficient grounds to bring charges against Mr. Bachmann. German law forbids the display of Nazi symbols and punishes incitement and hate speech. If the authorities decide to drag him into court, it won’t be the first time for Bachmann. Last year, the Sächsische Zeitung divulged his criminal record, which includes convictions for 16 burglaries plus drug-dealing. The first Downfall parody in which Hitler rants about Bachmann’s abject stupidity is surely just hours away.